As you may have already known by now what ruff is all about and what it stands to change in the IoT sector so I won’t be spending much time explaining that in this article. However, I will briefly want to say; Ruff project is a platform designed with the goal of improving commerce through the combination of the Internet of Things and blockchain technology. Now to the focus for today. Looking at recent developments with the ruff chain project, I will want to quickly point out some key occurrence . If you are in anyway like me who missed the token sales period but look to buy some of the token, then this will excite you greatly. The ruff project has added one new exchange to their list of exchanges and the ruff token is now tradable on Fcoin exchange. 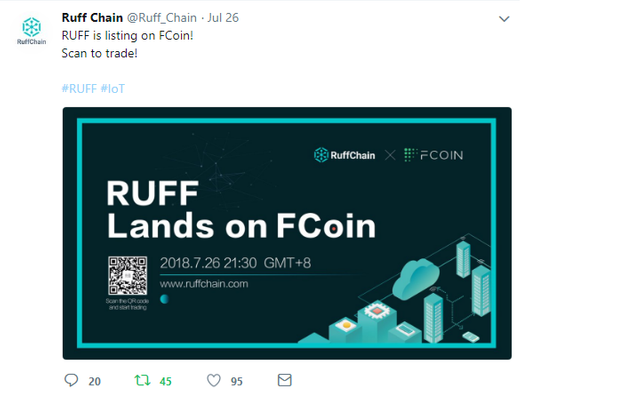 According to a tweet post by the ruff team on the 26th of july 2018, it was officially made public that you can now scan to trade ruff token on the fcoin exchange. Although there was no direct link added to the tweet leading to any available pairs on the exchange, neither did we find any links online directing to any pair on fcoin exchange but there are some other exchange available on www.coinmarketcap.com from where you can purchase the token. If you are into IoT technology, plan on venturing into it or maybe you are a fan on Ruff and will love to develop Apps using their platform, then this next information will interest you. The Ruff team has taken it upon themselves to tutor the public on how to develop IoT apps. They, as of the point of writing this article already have 3 tutorials available on their youtube channel. Just in case you missed the immediate previously released video, here are some key points from the tutorial. The Extra peripherals - EP2.2 of Ruff IoT Application Development Tutorial revealed the necessary steps to take to add devices to ruff.  5. Deploy and execute the app. Although this was a continuation from their previous tutorial and you might need to visit their youtube channel to get a full understanding from the beginning.